Artist-filmmaker Professor William Raban has been at the forefront of British experimental film since 1970, pioneering contributions to the evolution of the ‘expanded’ cinema movement with landscape, performative and multi-screen-based films that apply the potentials of spatial, temporal and light exposure experimentation. He was an active member of the London Filmmaker’s Co-op from 1972-1976 and has continued his cinematic practice in more recent productions focusing on urban change and the sociological transformation of city of London and its people. David Cunningham has similarly developed a career in music and audio-based art since 1976, with avant-garde works ranging from a body of installations exploring the interplay between live-mics, movement, space and acoustics, to more commercial work composing, recording and producing music for films and television. His most significant international commercial success came with his founding and leading of the band The Flying Lizards, specifically with the 1979 chart hit ‘Money’. Together, Raban and Cunningham have collaborated audio-visually since 1996, and in this Grad School-hosted event, the two shared their experiences of their long-standing creative relationship in conversation with an audience, plus the screening of two films (MM, and About Now MMX) shot, directed, edited and produced by William Raban, with the audio of both recorded, crafted and processed by David Cunningham. A 2002 film observing the urban and implied social changes of East London and the environment around the Millennium Dome (an 800 million pound state-financed structure for a one year planned exhibition) that Raban described as “an incredible waste of money” and one he sees as emblematic of the New Labour government of the time- the film immerses its audience into a series of city-scape shots, some moving, some static, collectively meditating upon an industrial landscape undergoing social transformation and an uncertain future. Following the screening, Cunningham spoke about his process of inspiration for the film’s feature of a continuous industrial-sounding drone. 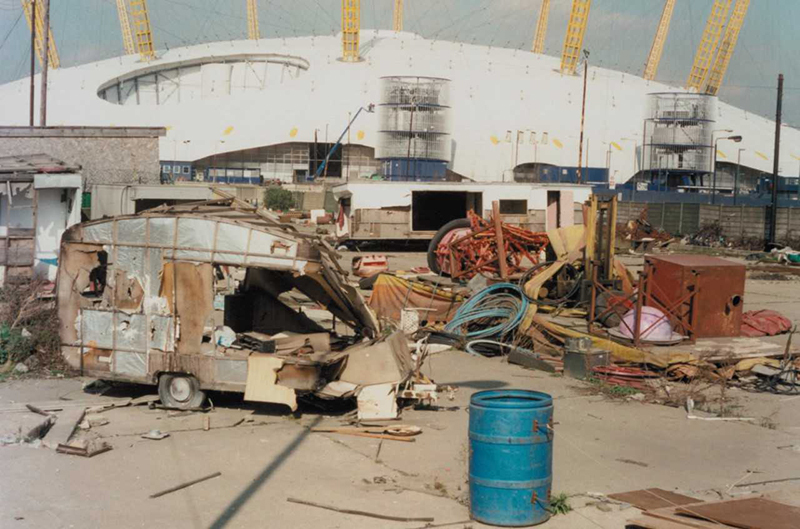 Triggered by experiencing the echoing environment of the Millennium Dome’s interior, he chose to re-create that audio environment using techniques he had been working on for his installations of the same period. This involved the idea of capturing a sound and feeding it back to itself repeatedly until it created the desired cacophony of a potentially endless echo. A 2010 film that follows on thematically and aesthetically from the earlier MM, this time filmed from one single location at the top of Balfron Tower and primarily using a time-lapse filming technique. This work also made substantial use of on-location, yet un-synchronised sound. 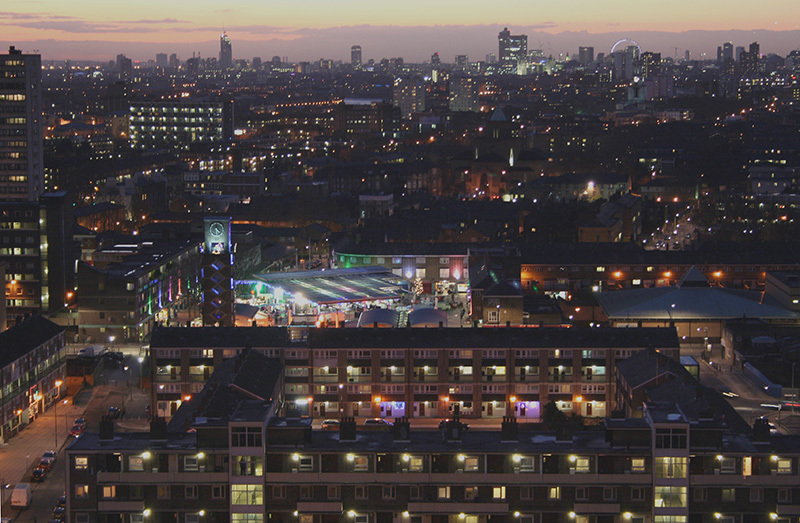 Cunningham revealed he had recorded the sound of Balfron Tower’s ventilation system and then slowed it down in order to create the drone of the film’s main soundtrack. The conversation was opened up to the audience, generating questions concerned with more analytical aspects of the two artists’ collaborative processes. Raban expressed his love for “error”, commenting that what he had previously viewed to be technical flaws and “mistakes” in his own work were now seen as fascinating insights into the process of creating the art- a reflexive process characteristic of Structuralist film. Cunningham agreed, and elaborated upon a “vocabulary of error” in his recording experiences with other musicians. Perhaps drawing from a neo-dada/punk ethos, he described the “mistake” as possibly the most distinctive characteristic of avant-garde music. This event was funded by LCC Graduate School.